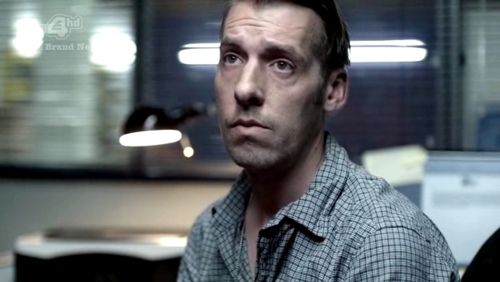 Craig Parkinson – (Ghosted – 2011). Hey Craig. Thanks for taking the time out to talk to me. ‘Ghosted’ has just finished it’s UK run in selected cinemas and has also come out recently on DVD too…for anyone who hasn’t had chance to see it yet, what is the general plotline surrounding the film? Well, I play Clay who runs the wing at Falkhill and takes what he needs or wants from anyone – from inmates to guards. Anything to make his time there smoother. Towards the end of shooting ‘Whitechapel’ series 2, I got a call asking if I would read the script and maybe go meet Craig Viveiros, the film’s director. As I was filming all day, I read the script on my phone and arranged to meet up with Craig that very night at the casting director’s (Amy Hubbard) office. What I really liked about the film, apart from the part I was in line to play, was the subject matter. A prison film that wasn’t about escape. What was it like working with the cast and crew on-set? Working with 1st time feature directors is always exciting and something over the years I have done a lot of and Craig was really fantastic. Very calm and precise with what he needs from you in a scene but open enough to let you play around and try a different approach, should you feel the need to. Also, working with Martin Compston again was always going to be great. He’s a fantastic actor with great skill and gut instinct and he loves to really “play” in a scene and find the truth. We’ve worked on a few films together and as a result he’s become a valued friend. John Lynch on the other hand, I had never worked with but I have been a great admirer of his work for years…I think most actors are! It was great to work so closely with John. He really takes a scene to another level and you just hope you can keep up! Filming ‘Ghosted’ was a tough and exhausting shoot for everyone but also one of the most exhilarating. Let’s talk a bit about you Craig. What made you want to get into acting in the first place? Well I started out at school in plays then went onto Blackpool and Fylde college after that, where a lot of northern actors had previously gone before (people like John Simm, David Thewlis, Dean & Craig Kelly). Today, it seems like a right of passage in Blackpool to go there before heading to Drama school in London. Going into acting was always a no brainer for me. It was always something I wanted to do and there was never going to be another option. What advice would you give to British actors wanting to get into the industry? You’ve been on a number of UK projects in your career – which one’s stand out for you as being memorable and why? Who have been your favourite actors to work with? Obviously ‘Misfits’ must rank highly up on the list, where you played the role of Shaun in series 2…perhaps ‘Four Lions’ too? I’ve been lucky enough to work with people like Martin Compston, Samantha Morton, Tim Roth, Sam Riley, Matthew Rhys, Allen Leech and obviously I love working with all the gang in ‘Misfits’. It’s very hard to pick anyone out as I can honestly say nearly all the actors I’ve worked with have been amazing and more importantly a really good laugh! I’d say over the last six / seven years nearly all the projects I’ve been involved with have been memorable, a stand out to me would have to be ‘Control’, as it meant so much to me: working with Anton Corbijn was a real treat and I felt very lucky to be a part of his first feature. It was a very special time. ‘Brighton Rock’ was special as it meant that Sam Riley and I could work together again. ‘The Unloved’, working with Samantha Morton in her directorial feature was also incredible. Ironically, it was also the first time I met Lauren Socha – a year before we met again on the set of ‘Misfits’. If you have a great experience working with someone – you long to collaborate again and I’ve been very fortunate enough for that to happen a fair few times. You also sometimes get a chance to work with people who you’ve longed admired. I’ve been given that chance with people like Chris Morris, Mike Leigh and Phil Daniels – which have all been incredible but left me slightly in awe… I certainly was in awe with Chris Morris as I’d grown up with his work and thought he was a genius… I still do. What does a Craig Parkinson day usually consist of? At the moment my day and night are blurring into one as becoming a Dad turns your world upside down…. in the best way possible! Well, I’ve just wrapped on ‘Misfits’ series 3 and I’ve got a BBC 1 sitcom out at the moment called “In With The Flynns”. Later in the year I’ve got a horror film coming out set in 1970’s Yorkshire called “When The Lights Went Out” where I’m starring alongside Kate Ashfield, Gary Lewis and once again Martin Compston….it’s going to be a fun year! Previous A Trailer Has Come Out For ‘The Dark Knight Rises’…..Just…Wow. Next Michael Eklund – (The Divide – 2011).